The Rotary Club of Marana organized Aid Station 14 for the 37th El Tour de Tucson. It was a beautiful day, despite with wind, and it appeared that everyone enjoyed themselves. Jo Holt brought her son, James, and Denise had almost her entire family present for the day. 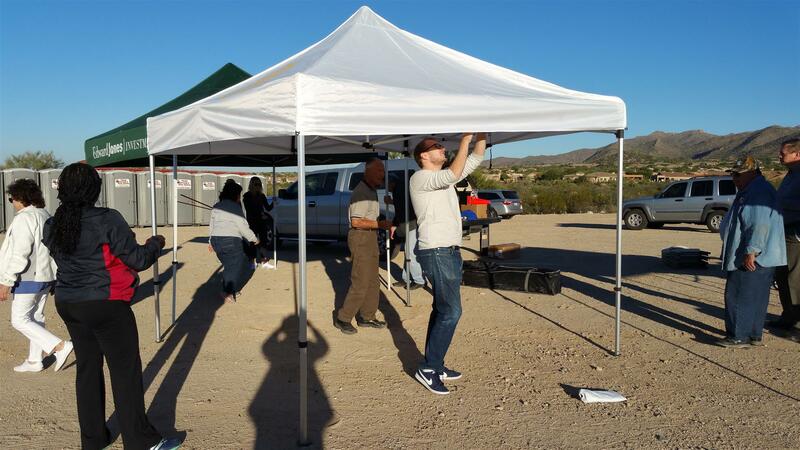 Rotarians from Dove Mountain, Tucson and Catalina Clubs, Interact Clubs from Tortolita and Mountain View, and the Roteract Club from UofA pitched in to help. Thank you to all of these volunteers. El Tour de Tucson had over 7,000 riders including Rotarians from around the world. Hector Hugo Rangel of P&S held off a pack of teammates and Mexican rivals to win the 37th El Tour de Tucson. The winning time: 4 hours and 10 minutes 47.12 seconds. Our volunteers saw him ride by about 10:03 a.m.
RI General Secretary John Hewko will be honored at this year’s El Tour de Tucson, an annual cycling event in Arizona, USA, in recognition of last year’s successful Ride to End Polio and the good work Rotary does around the world and the good work Rotary does around the world. This year, Rotary is aiming to raise $3.4 million, which will be tripled by the Bill & Melinda Gates Foundation for a total of more than $10 million for the fight to end polio. In August, the World Health Organization confirmed two cases of wild poliovirus type 1 (WPV1) in Nigeria, the first cases in the country since July 2014. While this news is disappointing for all of us, we must remain steadfast and fully committed to fighting polio anywhere children remain at risk, including Nigeria and Africa. Now, more than ever, we need to redouble our efforts to help Pakistan, Afghanistan, and Nigeria to retain strong immunization coverage globally. Supporting the Miles To End Polio ride is one way to show these countries that Rotary’s commitment to polio eradication is unwavering, whatever obstacles we face. As soon as the contributions are finalized, this story will be updated. John Zwick and Harold Burtzloff were in charge of setup and takedown. We couldn't have done it without their knowledge and effort. Tony Hunter provided excellent support because he ran the event last year. Kathleen Neighbors and her Interact students showed up around 2:00 p.m. It was good to see them because we were all tired, and they helped with clean up. Denise West took some to the family we adopted for the Holidays. El Tour organizers took fruit to the finish line. Maeve Johnson donated open boxes of cookies and pretzels to Northwest Fire Fighters. Containers that were not opened were returned to Costco for a refund. Thank you for everything you did to make this event a success. Many riders said this was the best station on the route. Rotarian riders stopped to thank us. Deb and Randy stopped, and everyone was glad to see them. They looked like they were working hard to conquer the route. This is a great event for our Club and if you didn't participate this year, we look forward to you joining us next year. A VERY BIG THANK YOU AND CONGRATULATIONS TO OUR CLUB VOLUNTEERS.